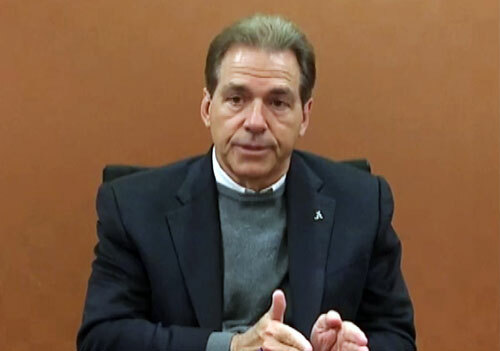 CHARLOTTE, N.C. – University of Alabama football coach, Nick Saban, will be the keynote speaker for The Charlotte Touchdown Club’s 2014 Bronko Nagurski Awards Banquet scheduled for Monday, December 8, 2014. The event, presented by The Charlotte Touchdown Club in conjunction with the Football Writers Association of America, is held annually to present the Bronko Nagurski Trophy to the top defensive player in the NCAA. “The Charlotte Touchdown Club is thrilled to have Coach Nick Saban as keynote speaker for the 2014 Bronko Nagurski Banquet,” said John Rocco, Executive Director of The Charlotte Touchdown Club. “We look forward to Coach Saban’s remarks and the announcement of the 2014 Bronko Nagurski Trophy winner at our black tie banquet held on December 8th at the Westin Hotel.” The black tie event will be hosted in the grand ballroom at The Westin Hotel. More than 1,000 people are expected. Proceeds will go to the touchdown club scholarship fund. Nick Saban is the current head football coach of the University of Alabama Crimson Tide. He previously served as head coach of the Miami Dolphins (2004-2006). On the September 1, 2008 he appeared on the cover of Forbes magazine as “The Most Powerful Coach in Sports.” If you would like to book sports legends like Nick Saban for a speaking engagement or special event, contact Nick Saban’s booking agent for appearance and speaker fees.